Set in 11 hectares of grounds including its own private beach, Msambweni Beach House is an ideal location in which to relax and enjoy the beautiful ocean views. This family owned and run hotel combines a perfect location with first class facilities and service, retaining an intimate atmosphere. The main house is an elegant Lamu-style building with whitewashed walls. Accommodation is in suites, each with ensuite bathroom and private veranda. All rooms are spacious and beautifully furnished. All rooms in the main building are light and airy, with high ceilings. In additional there are 3 separate villas, offering self contained luxurious accommodation, complete with their own terraces and swimming pools. The large infinity pool looks out over the ocean, while the winding jetty makes perfect place to enjoy a sundowner. The food is of the highest quality and is a mix of Swahili, Belgain and French cuisines, with an emphasis on fresh local seafood. Meals are served al freso by the pool or on the beach. The hotel also offers barbecues and picnic lunches. Guests can enjoy lazy days around the pool or stolling along the beach, with its palm trees and fine sand. Snorkelling, fishing, windsurfing, and croquet are some of the activities available, with scuba diving, golf and tennis to be found nearby. Relaxing massages can also be arranged. The hotel can organise excursions to Kisite Marine Park, known for its sea turtles and dolphins, and safaris at Shimba Hills, where elephants and antelopes can be seen. Location: Msambweni Beach, 80kms south of Mombasa on the Kenya Coast, and 32kms from the Tanzanian border. It is about a 2 hour drive from the international airport in Mombasa, and 35 minutes from the airstrip at Ukunda. Rooms: There are 4 1-bed suites in the main house. 1 of which has plenty of space for extra beds. The ocean suite is in a separate building near the main house and has and 3 private villas, 2 of which can sleep 2 couples or a family of 4, and the other sleeping 4 adults or a couple with 3 children. All are air conditioned, have satellite TV and DVD player. The main house suites have private terraces. Villas also have ceiling fans, moquito nets, terraces and private swimming pools. The main house can be hired in its entirety for groups. Activities: Swimming; snorkelling; sailing; mountain biking are all available on site as well as things like table tennis, croquet, badminton and beach volley ball. You can explore the area by mountain bike, and visit the local village. Nearby you will be able to scuba dive, play golf, go deep sea fishing and take part in other motorised water sports. Kisite Marine Park and Shimba Hills are both close by. Facilities: The hotel is set in 11 hectares of grounds and has over 200 metres of private beach. There is a swimming pool, spa and firepit. A laundry service is available. Dining: French and Belgian cuisine is served here (with a Swahili twist), and there is also an emphasis on seafood. You dine on the terrace by candlelight and meals in special locations can be arranged. Children: In the main house children under 12 years old are not permitted unless the whole house is booked for exclusive use. In the private villas children of all ages are welcome. "Pretty fine. Location superb. Mostly got the chance to be away from other guests apart from a very loud Hooray Henry. Staff were great. Facilities and rooms really good. Food- too much. More pick and mix, salads would have been good. But all was at a high standard." 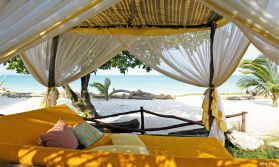 "Msambweni Beach House is in a spectacular setting on the cliffs above a quiet beach area, so you\'re unlikely to be troubled by the beach boys who hang around in so many other places on the southern coast. Having drinks before dinner on the viewing platform under the incredibly bright stars and Milky Way was quite an experience. My room was very spacious and had a large loggia which was occasionally visited by small inquisitive monkeys who seemed harmless but quite used to humans and therefore a bit on the cheeky side. I made sure I didn\'t leave anything out that they could make off with! Generally I thought the accomodation was of a good standard and the service acceptable if a little apathetic. MBH was very peaceful and made for a good final place to unwind at before returning to the UK."